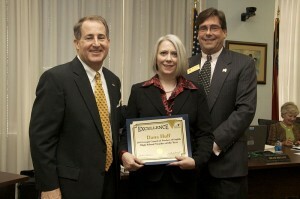 The Georgia DOE recognized me for being the Georgia Council of Teachers of English High School Teacher of the Year. It was a nice ceremony, mainly because the announcers took time to tell the audience all about the people being recognized. Often it seems these kinds of things are a blitz of names, and you don’t really have an understanding why anyone is being recognized. You can view other pictures from the event here. You should have seen the student writers being recognized for being state winners of the Georgia Young Authors Writing Competition. The young ones were especially cute. I liked hearing about the stories they wrote. The DOE also recognized two other English teachers, winners of USDA awards for school nutrition, the School Bus Technician of the Year, and winners of Georgia Association of Educational Leaders awards. I was honored to be in such company, especially the student writers. I am very excited and honored to share that the Georgia Council of Teachers of English has selected me as one of two high school English Teachers of the Year. I have been trying all week to finish the last English Journal so I can gush about all the Folger goodness, but I haven’t had a chance. Lest I let too much more time slip by, I’ll discuss the articles I have had a chance to read. Mike LoMonico, as usual, is on target with his suggestions for teaching Shakespeare in his editorial. The Shakespeare Set Free series taught me a great deal about how to teach Shakespeare, but participating in the the Folger Teaching Shakespeare Institute in Decatur last year transformed how I approach not just Shakespeare, but everything I do. I also read my friend Joe Scotese’s editorial about reading Shakespeare’s text as opposed to easy versions with “translations.” Joe’s description of the words as the tools of Shakespeare’s art (Stephen Booth) was beautiful, and I have had the occasion to bring it up twice in the last couple of weeks during teaching. Thanks for the timely imagery, Joe! I read Peggy O’Brien’s and Robert Young’s discussions of the history of Folger’s work with teachers (and students) and its present and future. I began reading Susan Biondo-Hench’s article “Shakespeare Troupe: An Adventure in Words, Fluid Text, and Comedy.” You might recall that Susan Biondo-Hench wrote the Romeo and Juliet unit in the first volume of Shakespeare Set Free. Several of my friends have articles in this issue. Chris Shamburg and Cari Craighead collaborated on “Shakespeare, Our Digital Native.” Cari and I were in the same TSI, and Chris and I connected at NCTE and online. I also met Chris Renino, author of the Macbeth unit in SSF and the EJ article “‘Who’s There?’: Shakespeare and the Dragon of Autism,” at NCTE last year. Chris and I both have autistic children, and though mine are younger, I am obviously excited to read his article for personal reasons as well as professional ones. Christy Desmet, who wrote “Teaching Shakespeare with YouTube,” and I have a long history together. She teaches at my alma mater, UGA, and we worked together about 12 years ago in an online cohort of new teachers, professors, mentor teachers, and aspiring teachers. Our conversations were so helpful to me as a new teacher. We reconnected at the Folger TSI in Decatur last year. I really wanted to submit an article for this issue, but I was struggling with new roles as department chair and graduate school student, among other duties. I just didn’t have time to do it. And now I’m kicking myself because I would have loved to have been a part of this issue. In related news, Folger has a new blog: Making a Scene: Shakespeare in the Classroom. Definitely check it out! I’m really excited about it. I want to talk about all of these articles and blog posts in more detail when I have a chance, but the weeks have been ticking by, and I didn’t want too much time to elapse before I brought your attention to these resources (if you didn’t know about them already). 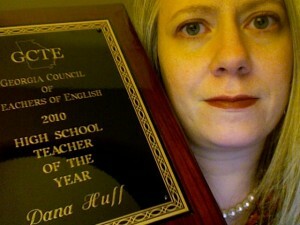 In other news, I am not able to go to NCTE this year. I knew it was a long shot because I went last year, and the economy being what it is, well, let’s just say I was fairly sure it wouldn’t happen. I do wish I could go, however, because I really wanted to meet up with some friends (not to mention the learning!). I am planning to go to GCTE and possibly ISTE. ISTE takes place in Denver this year, and school will be out, so it would be a good opportunity for me to visit family in addition to attending my first ever technology education conference, so I would like to try to go. Some of you may know I went to the annual GCTE (Georgia Council of Teachers of English) convention this weekend. It was great, but the numbers were down — probably the economy. I know lots of the schools systems have probably told teachers they would not pay to send them to conventions this year. For instance, my children’s system is not paying for field trips this year, so it may be they are also not paying for conventions. I presented a session on Using Blogs and Wikis for Professional Development. I was at first disappointed that it was somewhat sparsely attended, but I think that was the norm. Several sessions I attended were like that. I had six folks, which I think is just about what I had at GISA. It makes sense that the folks who attended the Folger TSI except for Mike LoMonico, who was awesome moral support, didn’t come as I had presented some of the technologies I shared with them over the summer. Lots of my fellow TSI participants were there, and it was good to see them again. I was also grateful that my friend and colleague Rebecca came to my session, even though she didn’t have to because she works with me, and I was thrilled to finally meet Clix after working with her online for a couple of years. She also came to my session even though she already knew everything I was sharing (thanks!). Aside from my three friends, I had three other attendees, and I hope they found it interesting and learned something they can use. I do think the presentation went well. I used Keynote instead of PowerPoint, and I basically wrote down everything I wanted to say in my notes and created the presentation from that so I could avoid crowding my slides. I’m learning! Keynote has such beautiful templates! I went to Mike LoMonico’s Folger presentation, and it was good as always. Julie Rucker and I covered some of the same ground, but our focuses (foci, if you want to be a pedant) were different, and it was good to meet her as well. I also attended Buffy Hamilton’s presentation on multigenre research projects, and I am most excited to try one. Multigenre research projects are something I had heard about but didn’t know much about, so I saw Buffy’s presentation as a great opportunity to learn more. She created a fabulous wiki to share her presentation. I found it so inspiring; I think I’ll work some more on the wiki I created for mine. Aside from the wonderful presentations, the best part of GCTE was seeing everyone again. Gerald Boyd, who is our state Language Arts Coordinator, used to be the Language Arts Coordinator for Houston County when I worked in that system, and we had crossed paths on several occasions. It was also good to see Peg Graham again, who was not my professor when I went to UGA, but whom I knew through my own professor. Of course, all the Folger folks were fun to see again. I also got to meet Jim Cope, with whom I have exchanged e-mails and who really saved my rear-end when he loaned me a cable I didn’t realize I had forgotten to pack. I had a great time, and I hope Rebecca did, too. I feel excited and energized! Last week, I had one of my classes present their scenes from Taming of the Shrew. I have some great comic actors in my classroom. This coming week, another class will present scenes from A Midsummer Night’s Dream. I am looking forward to seeing these scenes as well. My ninth graders will begin preparing to present scenes from Romeo and Juliet, too. I am so excited to have finally figured this out. I have used some Folger stuff for years, but I shied away from performance because I just wasn’t sure how well it would help students learn the play. And yes, I know how ridiculous that sounds. After actually going through the process of performance and presentation myself, I learned how much it truly does help foster close reading, critical thinking, and enjoyment of the plays, and the light bulb finally went off. I will never teach a Shakespeare play in the future without incorporating some elements of performance.